In the heart of the new La Villette quarter in Paris' 19th arrondissement, the Rosa Parks aparthotel offers you ready-to-live-in apartments and a wide range of customized services and amenities. 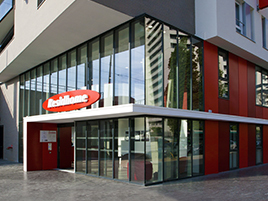 The residential hotel is located near the “Corentin Cariou” metro station and the RER train station. You will appreciate the vibrancy of the neighborhood, where shops, cinemas, and restaurants are in close proximity. For sightseeing and entertainment, there are lots of activities to explore: the Parc de la Villette with the Canal de l'Ourcq running through it, the Cité des Sciences et de l'Industrie science museum featuring the famous Géode dome cinema showing IMAX films, the Cité de la musique- Philharmonie de Paris music complex, as well as the Zénith de Paris arena, a venue for numerous artistic and sports events. Open 24 hours a day, our new residence featuring contemporary architecture offers 135 apartments, ranging from studios to one-bedroom units. Each apartment has a living room, a fully-equipped kitchen (microwave, refrigerator, glass-ceramic cooktop), a bathroom with a shower, an office area, and a television with international channels. You will appreciate the complimentary amenities and services available to you, such as internet access (WiFi connection) and a fitness room. Many services and amenities that are available for an additional fee will make your stay a smooth one: breakfast served from 7am to 9:30am, washing machines and laundry service, parking, meeting rooms, etc. A wide range of services and amenities for your comfort.